News from LMCU: How much do you need to retire? In light of Social Security changes and company pension plans becoming rarer, the responsibility for retirement funding is falling squarely on the shoulders of the retiree. But how much do you need to save in order to maintain your standard of living? Your first consideration is choosing your age of retirement. The longer you wait, the more time you’ll have to accumulate funds. Get a handle on what Social Security will provide by visiting ssa.gov. Then consider inflation. At an average inflation rate of 3%, your cost of living will double every 24 years. Your annual income will need to rise to match. Medical costs will also likely rise. The average nursing home costs over $87,000 per year. Most experts estimate you’ll need 60% to 100% of your annual pre-retirement income. Calculations can get complicated, so it’s best to have an experienced retirement expert evaluate your situation. 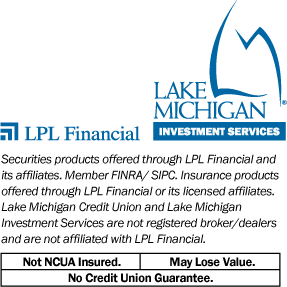 As independent advisors, Lake Michigan Investment Services (LMIS) offers personalized financial strategies based on your unique situation, attitudes, dreams and goals. If you’re thinking about retirement, call LMIS to arrange a free financial review. Schedule your appointment with us today by calling (616 or 800) 242-9790 ext. 6301 or go online to LMCU.org/investments.